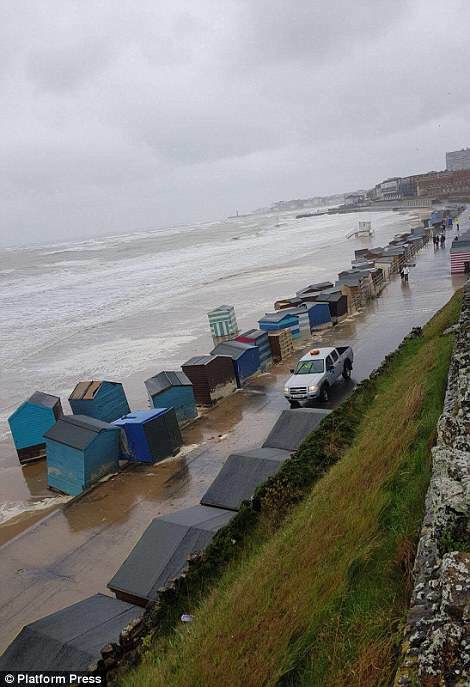 A man has died after being washed off a harbour wall in Ramsgate in Kent as 60mph winds and heavy rain batter parts of Britain. 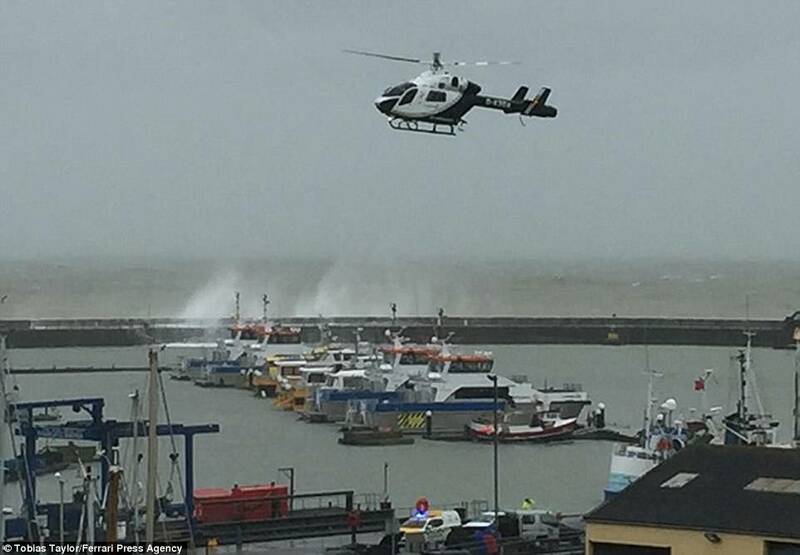 Kent Police said they were called to the scene in the Royal Harbour, Ramsgate, at around 11.30am this morning to reports three people in the water. Though all three were recovered, one was later pronounced dead. The other two were taken to hospital for treatment. 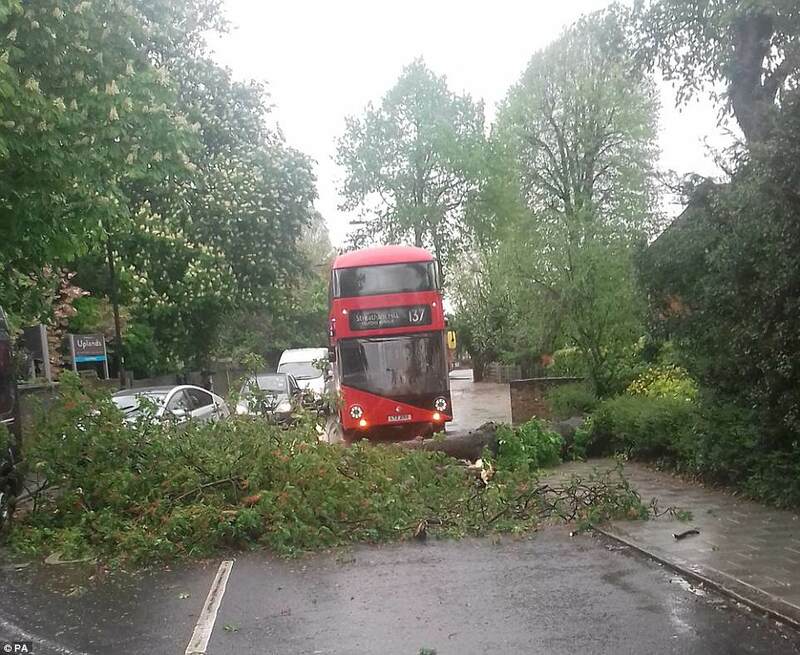 Fallen trees blocked roads in Kent, East Anglia and parts of London, and rising floodwater saw some have to be plucked from their vehicles by emergency services. 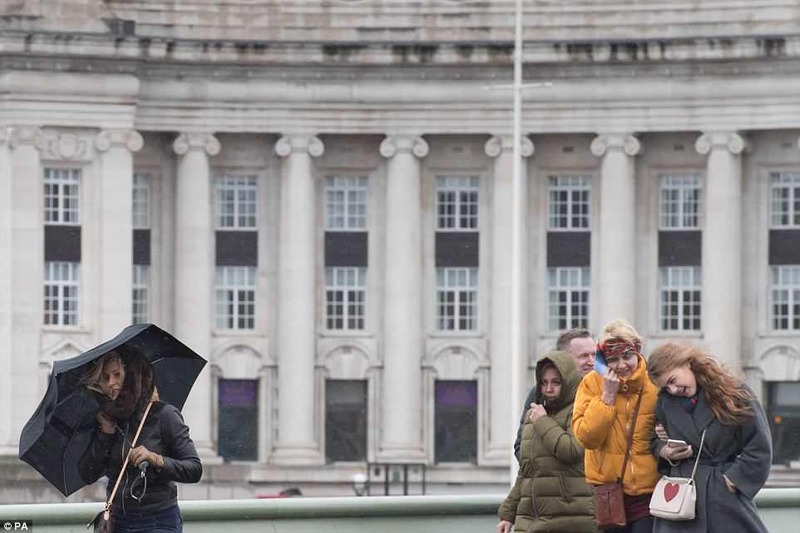 The Met Office issued a yellow warning for rain and wind for most of the South East, and said so far more than a month's worth of rain had fallen within 24 hours in some places. 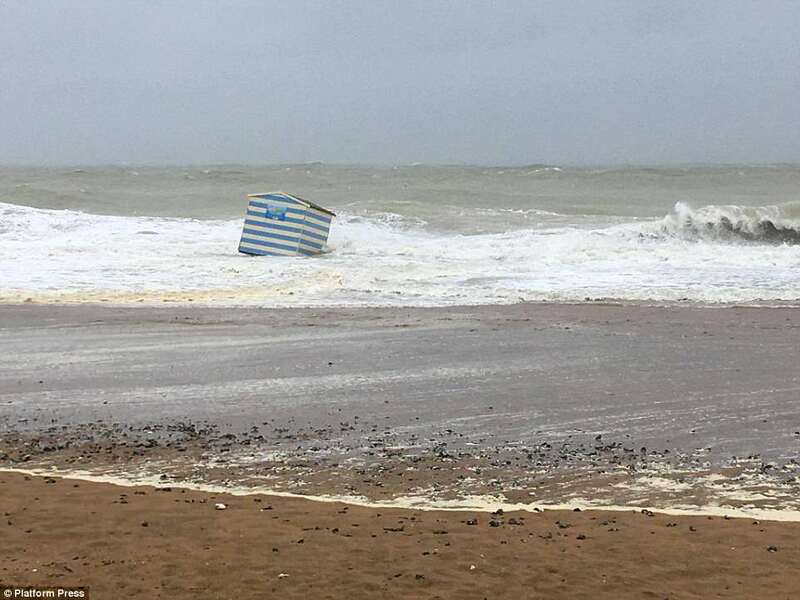 Weather conditions in Ramsgate were described as 'atrocious' by the RNLI, with waves reportedly breaking over the harbour wall. 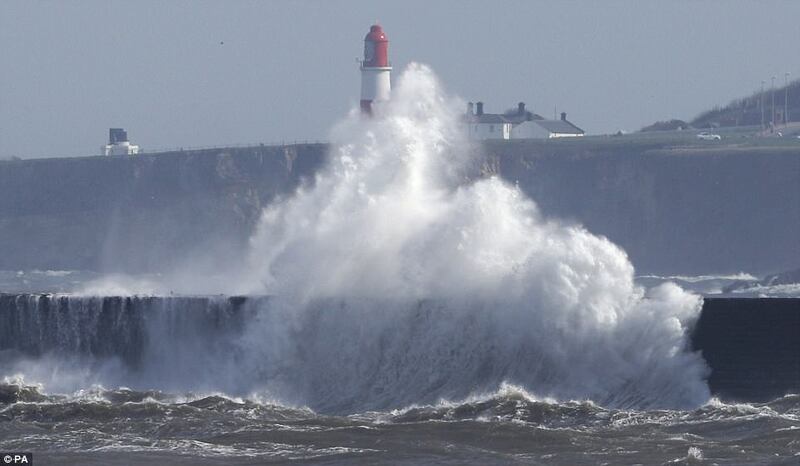 It is understood that the combination of a spring tide and the strong winds caused the large volume of water to batter the coast. 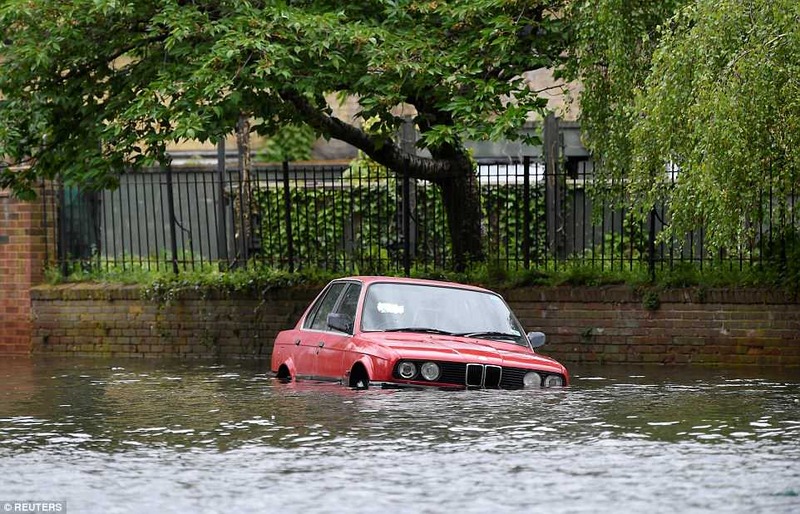 Elsewhere a family of two adults and a baby had to be rescued by Kent Fire and Rescue Service after their car became stuck in flood water on Stickfast Lane, Sutton Valence. Crews also helped two drivers from separate cars which had broken down in knee-high flood water in Minnis Lane, Dover - moving the vehicles to safety they also removed a fallen tree which was blocking the road. 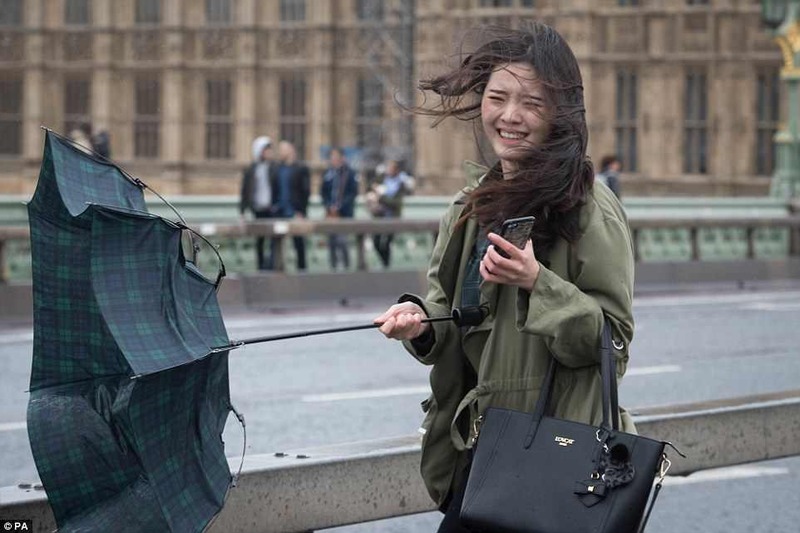 Met Office Meteorologist Alex Burkill said by 5pm on Monday the largest recorded amount of rainfall in a 24-hour period was in Lenham, Kent with a current total of 57.6mm (2.2 inches), while Canterbury in Kent saw 45.9mm (1.8 inches) and 41.3 mm (1.6 inches) fell in Faversham. 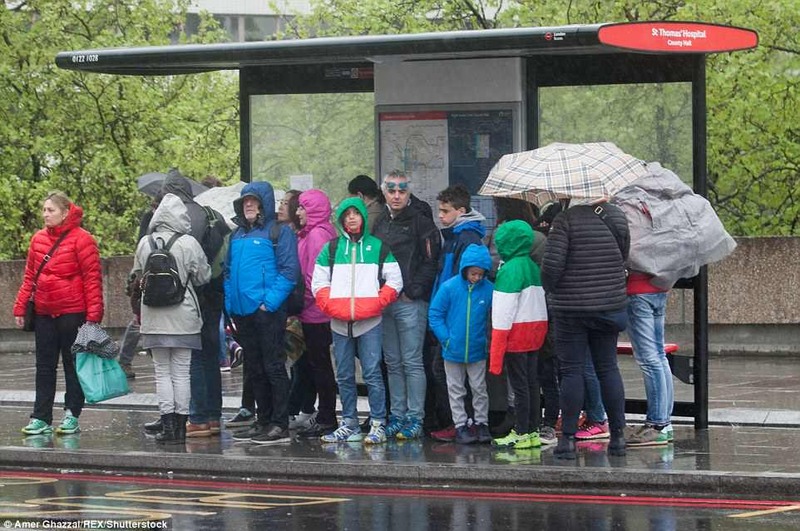 Just to put that into some context, Kent's average April monthly rainfall is 49mm (1.9 inches) so it is fair to say it has seen over a month's worth of rain in a day,' he said. 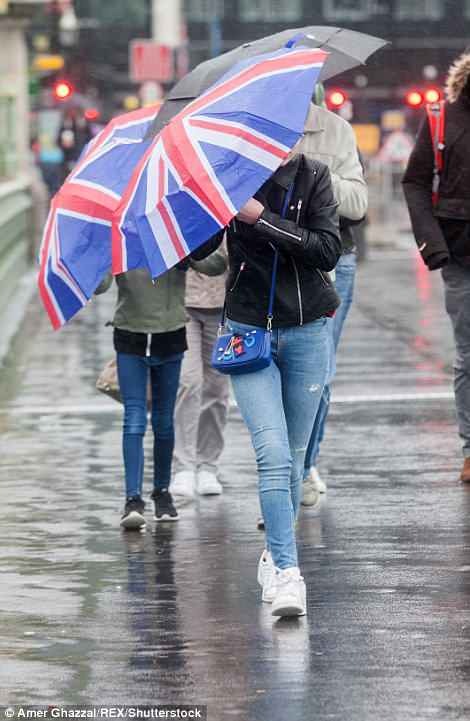 Mr Burkill said the rain would clear Kent by 10pm with downpours expected to affect East Anglia until about 2am. 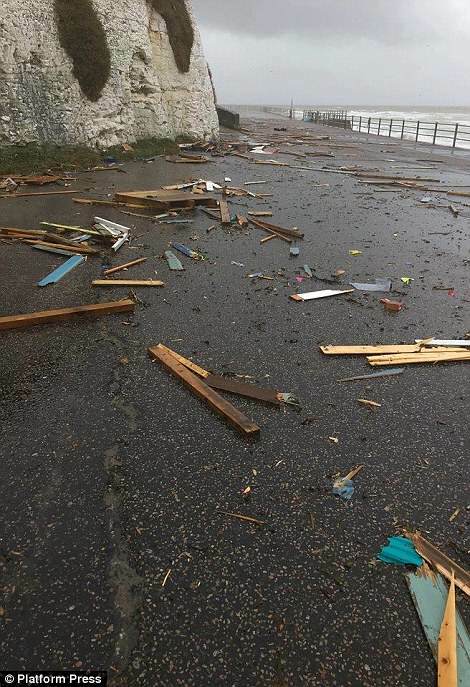 As rainfall blighted the South, 54mph gusts of wind were also recorded in Langdon Bay in Kent, with 48mph also seen in Donna Nook in Lincolnshire, Mr Burkill said. 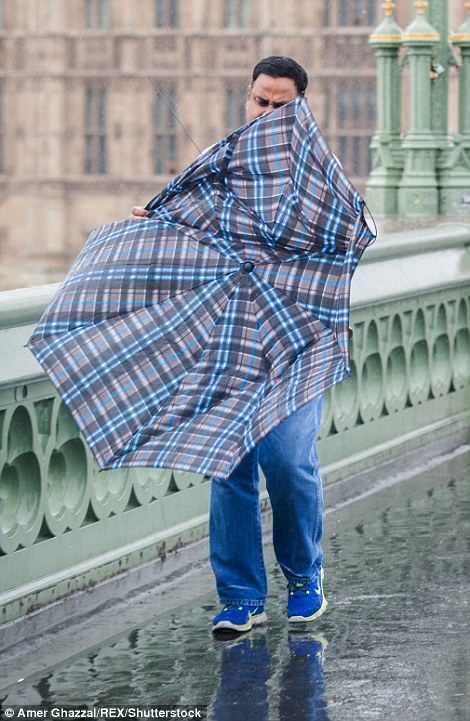 'The rain has affected a good chunk of the South East, East Anglia, London has been on the edge of it, and down to Hampshire,' he said. 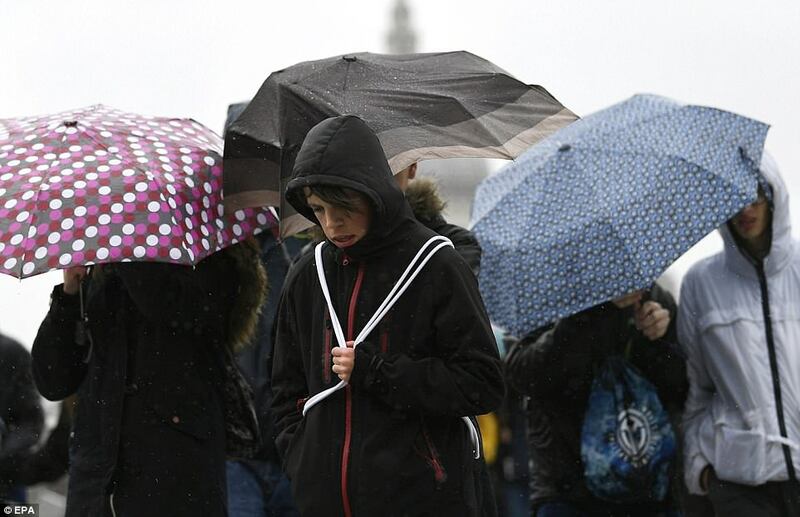 The soggy start to the week also came with chilly temperatures, with the mercury struggling to rise above 5C in Kent, Mr Burkill added. 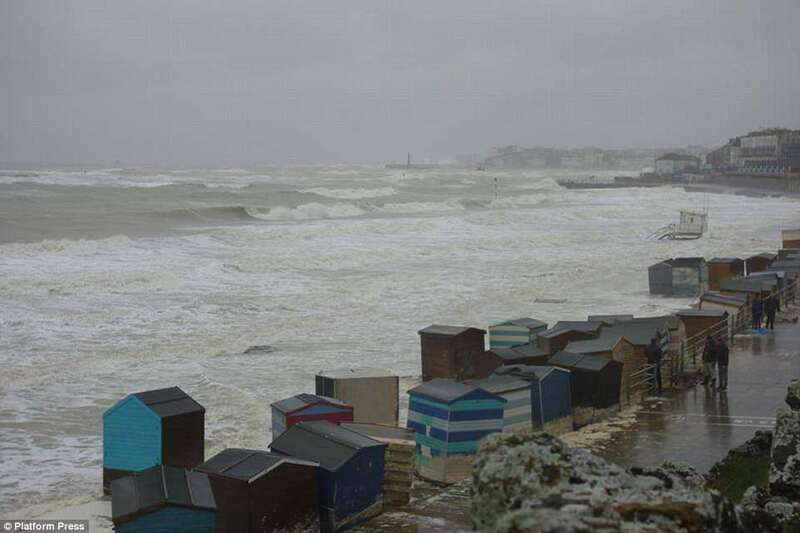 A Coastguard rescue team and an RNLI lifeboat were scrambled to rescue the men who fell into the sea in Ramsgate earlier. 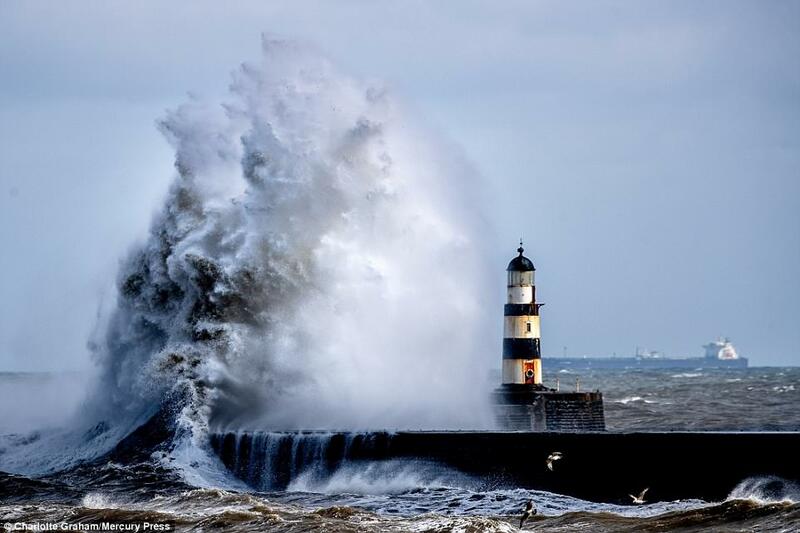 The men were on the pier which forms part of the harbour wall at Ramsgate when the wave hit them and swept them into the harbour water.